We hang lights for weddings & parties all year long!!! As your professional light installation company, we focus on client satisfaction. Our business is about service and we are not happy until you are happy. Years of experience have provided us with the ability to assist you in every holiday decorating need. We want the opportunity to provide you with the most enjoyable holiday experience possible. 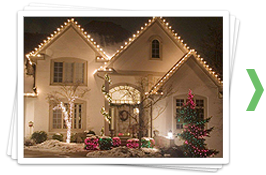 We listen to our customers wants and desires for their holiday lighting. From there we will give our customers an estimate detailing the type of lights we are going to use as well as what parts of the exterior or interior will be decorated. Once the estimate is approved, we will set a date to install the lights and decorations. •· No job is too Large! Our schedule fills up extremely fast. If we do not book you early, there is a chance that we may not be able to fit you into our schedule. Please assist us in booking by contacting us as early as possible. Our satisfied clients are our best resource for new business. Our service is second to none and has earned us a valuable source of referrals. If you are considering having your lights installed, please give us an opportunity to earn your business too. We are confident you will be very happy!